Over 30 Models Available! - Slate Tables Starting at $1199.00! The Nora makes a statement in its unique design. The rich Antique Walnut finish works with any decor. The double arched cabinet, and rams horn legs sets this table apart. Made with solid wood legs, rails, and body, this table will stand up over time. Our Uni-Body construction eases the assembly and disassembly process. Double crossbeam construction supports the slate and adds stability even under the most aggressive play. The Nora features 1-inch backed K pattern slate, K66 cushion rubber for a true rebound, pearlized double diamond inlayed sites, leather drop pockets with diamond shield. The Nora makes a great addition to any home. The Ramsey 8-foot billiard table is both beautiful and practical. The beautiful design and workmanship on this table makes it a centerpiece in any home. Solid wood rails, body and tapered legs are the heart of the table. The elegance of the routed cabinet and legs is enhanced by the leather pockets with diamond shield, and the pearlized double diamond sites. Great play is assured by the K66 cushion rubber and the 1-inch backed K pattern slate. The practical is the integrated accessory drawer that holds all of your accessories. Our Uni-Body design makes assembly and disassembly easier; the body comes fully assembled. Double crossbeam construction supports the slate and adds stability to the table to ensure you that you play your best. If you want both beauty and practicality, The Ramsey is the billiard table for you! The Buchanan's rich two tone black and antique walnut finish sets this table apart. The two tone finish on the body and ball and claw feet will make this table a conversation piece and provides lasting beauty. Built with solid wood legs, rails and body for strength and stability. The fringed leather drop pockets, arched cabinet design and double diamond, pearlized inlayed sited add richness to the table. Performance features include our Uni-Body design that eases the assembly and, when needed, the disassembly of the table; the double crossbeam construction that adds support to the slate; and the K66 cushion rubber assures a true rebound. 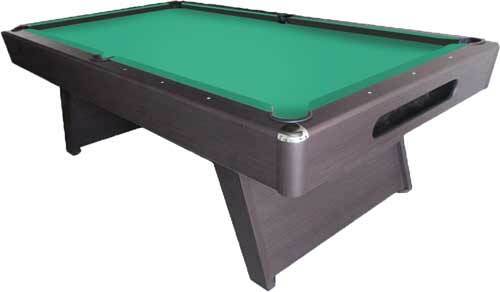 Beauty and performance combines to make The Buchanan the best billiard table available in its price range. Cabinet assembly required. The Penelope 8-foot Pool Table from Imperial is not just for shooting pool. It comes complete with a dining top so you can entertain your guests with a meal and fun! The table is solid wood made of Aspen and finished in a gorgeous dark walnut. The pool table features leather internal drop pockets, K66 cushion rubber for true rebound, and 1-inch backed K pattern slate for true roll. The post legs keep the table stable during play or when the group is dining. The ding top is a 4-piece design to make storage and handling easy. It is made of solid Aspen. The Penelope makes a great addition to any home and adds the flexibility for a large dining party when needed. Distance from floor to the bottom panel is 24-1/2 inches. The Imperial Sharp Shooter 8-foot Billiard Table will make a great addition to any game room. This is a regulation 8-foot pool table with an 88-inch x 44-inch playfield. Wide rails with K66 rubber provide a solid rebound. The 1-inch slate bed is supported by a plywood main beam means that you get a true roll. Chrome finished metal corner caps and a n attractive wood grain wrap finish that will provide long lasting good looks. Plastic internal drop pockets. MDF legs and leg panels provide stability. Ball storage area in the end apron. The Sharp Shooter will provide years of fun and great play! Cloth not included with table; purchase your choice of style and color separately. The Shadow 8' pool table is the ultimate in simplicity and has a classic Arch frame with tapered legs. Detailed routing on the frame and legs and finished in matte black with 1" backed slate. The Washington 8' and 7' pool table features a classic Arch frame with router detail, tapered legs with accent routing, Mother of Pearl diamond signts and 1" backed slate. Available in Antique Walnut or Charcoal.